Good personal finance is more than just about managing expenses. Sure, you can take active steps towards optimizing your expenses and saving more. You can also eliminate unnecessary expenses and boost the amount of money you can save every month. But saving money is just one half of the equation. The next half is investing. You want your money to do all the hard work and making healthy returns on a regular basis. There are a number of things you can do to invest, but in this part we are going to focus on the cash-flow investments that are worth making today. Nothing feels better than having a healthy cash flow. You don’t have to worry about timing your expenses or not having enough money to pay your bills when your cash flow is healthy. Aside from a regular salary, one of the best ways to generate cash flow is by investing in a business. Retail businesses tend to work best for generating a healthy cash flow. Focus on fast-moving items that consumers regularly use and you will be able to grow the business steadily. Once you reach a certain point, you can even choose to leave your job and run the business full-time. Other business opportunities work for this purpose, too. Restaurants, coffee shops and online businesses can be equally profitable. The latter even allows you to start your own business without worrying about large overhead costs and huge initial investments. Try to find a niche or a market segment that you can fill. If you’re thinking about opening a coffee shop, for example, you can tweak the concept so that the shop also acts as a co-working space and a virtual office. By doing so you’re simply adding more sources of regular income to the business. 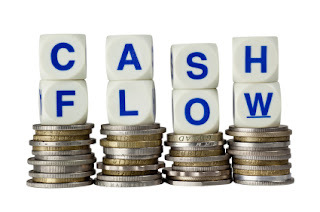 Another great way to strengthen your cash flow is by increasing your income. There is no better time to pursue a promotion than today, since companies are growing with the market and new jobs are being created by the day. There are a lot of management-level jobs available too. If you want to give your career a push forward, consider investing in education. Thanks to the wonders of the internet and top names such as Rutgers University making their online courses more accessible, it is now easy to pursue a master of science or a masters in business administration degree online. The AACSB online MBA program is a good example of how online education can help boost your career. The course can be completed in as little as 12 months and you will get an accredited degree at the end of the program. Lastly, we have the property market. If you have accumulated enough savings, an investment in the property market is actually a lucrative opportunity to explore. Invest in properties that you can rent out to tenants and you will have steady streams of cash flow in an instant. We now have great buy-to-let mortgage loans and other financing options on the market. There are also still a lot of properties being sold at bargain prices. Be smart with your property investments and you will soon be able to invest in more properties just from the income you’re making in this sector. All of these investment opportunities are great sources of cash flow for your estate. The more investments you make, the stronger your personal finance will be and the more you will be able to invest in the future.